A long time ago, in a land far away (OK, Australia) a couple of blokes found a way to stuff audio into a computer chip, and then get the chip to spit it back out when you played an attached keyboard. Being clever chaps they also managed to get it to play back at speeds related to which key you played, and so if your initial ‘sample’ was a dog bark, then you were all set to have it play ‘How Much Is That Doggy In The Window’. Back in 1978 this was nothing short of miraculous — bring on appearances on Tomorrow’s World, etc — and the Fairlight became an overnight celebrity. But (and a big but indeed) at around the cost of a large four-bed detached house it was not the thing that mere mortal musicians might ever own or even play. J M Jarre and Peter Gabriel had one, so did Thomas Dolby, Klaus Schulze, Vince Clarke and the Pet Shop Boys (maybe to make their ‘I Want A Dog’ track...), and soon EMU side-lined their chunky modulars to give us the only slightly cheaper Emulators. It wasn’t until a few years elapsed that the more down-to-earth Ensoniq Mirage keyboard sampler and cheeky Akai 612 rack module arrived to the delight of the perpetually broke. The Musicians Union were predictably apoplectic (the same old ‘Mellotron’ argument), but there was no looking back and sampling has now been with us longer than the DX7. Size: 20HP. Current: +12V = 145mA, -12V = 39mA.Run by the charismatic Dan Green, 4MS are an American company who for the last decade have been producing interesting modules that take a sideways look at the competition and then offer their own particularly slanted take. 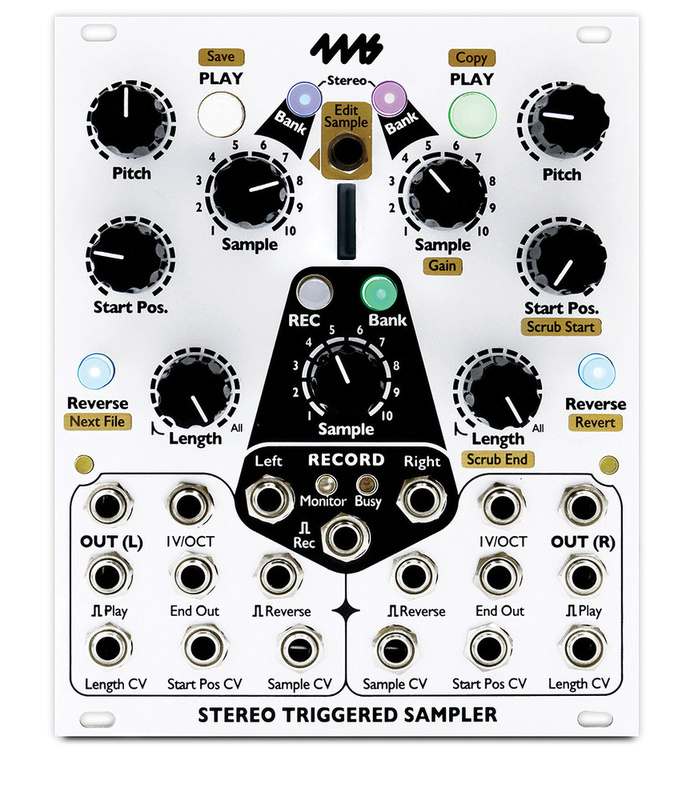 Their RCD and SCM clock divider/multiplier units are probably found in any serious Eurorack setup, and their ‘ping-able’ LFO and Envelope Generator sit well coupled with their Quad Clock Divider units. Recently they produced the wonderfully eccentric (and technicolour) Spectral Multiband Resonator and the lovely Dual Looping Delay (8.5 minute delays/loops anybody?). It is an extension of this delay technology that gets us to the Stereo Triggered Sampler in front of me. This is a high-fidelity two-channel stereo audio recorder and playback module that can record high-quality (stereo) WAV files whilst simultaneously playing two different (stereo) files. One look at the panel, and it is clear that this is really two identical samplers side by side with an identical feature list. All sample parameters — 1V/oct pitch, Sample file selection, Start Position and Sample Length — are CV controllable, and there are trigger jacks for Play, Reverse and even Record. An ‘end of sample’ trigger output allows some fun if you use it to trigger the other half of the unit, or the reverse function. You can also edit samples you have recorded and then store them to an onboard microSD card, which can hold 600 samples of up to 32-bit/96kHz. This card comes pre-loaded with ready-to-go samples, from basic percussions and some ambient nature noises, to a lovely lady chastising someone in Polish about the price of beetroot (maybe!). Reducing the sample length knob to zero sends you into ‘granular land’ and further tweaking of start position and pitch controls will generate all manner of interesting squawks — especially when the external CV sockets get involved. On power-up, all the switches light up purple (a good start) but then revert to blank ready for action. The Play button is where you start, though it took me a while to not hit the Bank button by mistake (and getting back to the previous bank involves Reverse and Bank pushed together). Each Bank has 10 samples available — via knob or CV — and there are 60 banks. They are denoted by which colour the Bank button shows, and if it blinks, how often it does it. You can choose how the two channels appear at the (stereo) outputs (dual mono or superimposed stereo) by pressing the two Bank buttons together for five seconds, and channel output volume can be trimmed by pressing Reverse and moving the Start Position knob. There is no indication that you have done this, and this brings me to my first concern with the module: lovely as all these coloured LEDs are, they are no substitute for even a basic numeric display, or maybe a little OLED screen, to help you navigate and keep track of what you are doing. The unit comes with a well-produced ‘getting started’ booklet, but I found after a week or more I always had it to hand when trying to explore the unit further and unlock the myriad esoteric ‘push the button and tweak that knob’ options. As yet if you want to re-sample what you’ve made — and I wanted to — you have to make an external patch, though a future firmware fix should sort this. We have been spoilt by modern sampling devices that offer multisampling. This is abundantly clear when you realise this unit is only monophonic (OK, duophonic if you use both halves together) and this is maybe not the most sensible use of this module. Embrace the golden days of munchkinisation and barking dogs! I got most satisfaction either manipulating granular stuff, or just slowing stuff right down (the knob goes four octaves up and down, and you can get minus nine octaves with the CV input!) and CV’ing the length, start position, scrubbing and reverse. Just a note about those CVs: to start with I was frustrated that I seemed to get more success manually moving the knobs than getting CVs to do it for me, until I realised that although the pitch CV takes -5V to +5V, the other CVs are 0V to +5V. Half my LFO cycle was doing nothing! Luckily I had a 4MS SISM utility mixer on hand which allows you to add (or subtract) a DC offset to inputs, so I could match my finger tweaks better. Given that 4MS usually manage a novel take on modules, this one is strangely normal! Make Noise’s Morphagene does a lot of what this STS will do, but then adds its own twist. I initially wondered what a sampler was doing in a modular anyway, but have now realised that it is a great source of some genuinely odd stuff. I think my issue lies with just how inscrutable and enigmatic the control system is. Even a basic alpha numeric would be a help, and having no indicator of your output gains/volume levels is poor. I found a lot of the pre-recorded samples very hot, and had to pad them. Given the hi-fi spec, I was also surprised how non-fi a lot of the clips were. Maybe samples have never grown out of their old 8-bit Fairlight days! 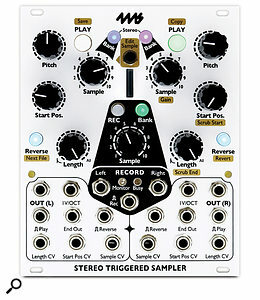 In the end, I liked this module a lot — especially the CV control inputs — but those two years the STS spent in development are a long time in the technology world, and today there seems to be no shortage of things on the market that offer sampling in all its forms simply at the push of a button and the flash of a screen.